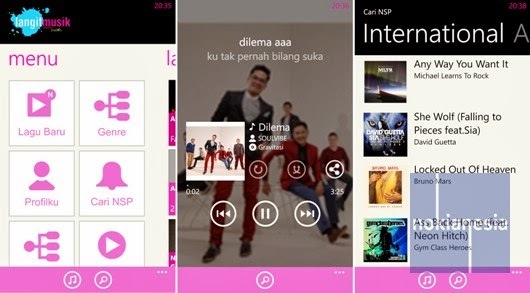 Let's start to enjoy and explore your favorite music on your Nokia Lumia with Windows Phone 8 with the official "LangitMusik" Application on your Nokia Lumia with Windows Phone 7.x and 8. "LangitMusik" is a music streaming and download service from Telkomsel Indonesia powered by Melon Indonesia that provides you up to 1.000.000 legal songs from local Indonesia and International. To enjoy the unlimited music streaming (full track) and download, you must be a Telkomsel customer and spend your Telkomsel (simPATI or AS or Kartu Halo) balance for IDR 11.000 (including tax) for 30 days. If you don't have to, you can streaming music with limited track (1 minute only) and you can't download your favorite songs. The services and features is similar with Nokia MixRadio, so which one is your choice and your favorite? Nokia MixRadio or LangitMusik by Telkomsel ? Leave your comments below. For more information about LangitMusik, please click here.